Shopping for Walking Dead Plush? Daryl Dixon from The Walking Dead TV show as a Pop! Plush from Funko! Modeled after actor Norman Reedus' portrayal of Daryl Dixon on AMC. Features a 7-inch tall Daryl Dixon in a poncho with his crossbow at the ready! Wearing a poncho with crossbow at the ready, it's The Walking Dead Daryl Dixon Pop! Plush! 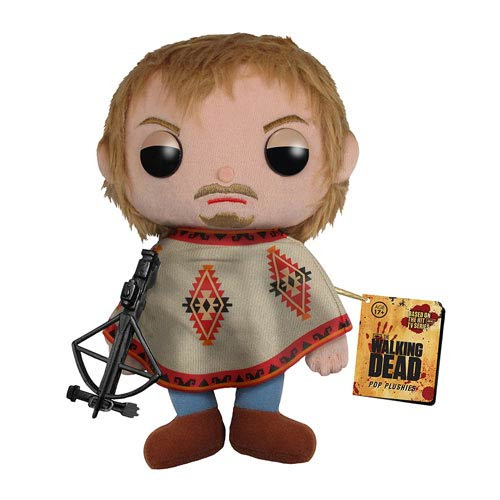 This detailed 7-inch tall plush features Daryl Dixon with shaggy 'do, facial hair, and a serious expression on his face. Modeled after Norman Reedus' portrayal of Daryl Dixon on the AMC TV show The Walking Dead, The Walking Dead Daryl Dixon Pop! Plush makes a great gift for fans of the series. Ages 17 and up.